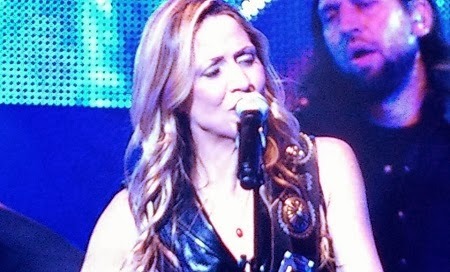 Sheryl Crow has reinvented herself with her new country album titled, “Feels Like Home.” This is her first album in three years, who dropped the soulful effort, “100 Miles From Memphis,” back in 2010. If you look at the history of the singer/songwriter, each album takes a personal look at her current situation and touches on various genres throughout her storied career. From the pop/rock debut, "Tuesday Night Music Club," to the dark, break-up alternative effort, "The Globe Sessions" and from the fun summer song set of "C'mon C'mon," to the slightly less commercial album "Wildflower," Crow's single common denominator on each of her albums is her songwriting. “Feels Like Home” is no exception, whose writing and melodies are just as good as her previous ones. The singer/songwriter stopped by Moline’s iWireless Center last night to play a set of her greatest hits and a few songs from the new album. The show, which for all purposes was a country show with co-headliner Gary Allan, brought out a “best of” set with a hint of country. If there was any song on her previous albums that could have been a crossover hit, she played it. Crow also performed “Redemption Day,” a song that didn’t get a lot of notoriety but was later resurrected by the late great Johnny Cash, who covered the song in 2010. She played it with Cash’s vocal parts via a big screen in the background. The highlight of the night, though, was when Gary Allan came out and sang, “Picture,” with Crow, which originally featured Kid Rock. These two artists are at the height of their game and they showed it last night.